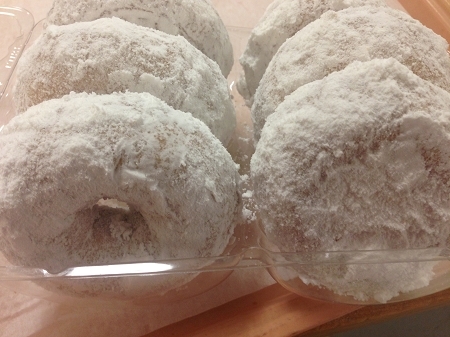 Home > Donuts > Donuts-Powder Sugar Casein Free (6 per box). These donuts are amazing. I love the taste and texture. The label on the box reads 2 grams of fat per serving. Could it be true? Either way...I would buy these donuts again. Two thumbs up. My family of 6 has to maintain a gluten free diet. One thing they really miss is donuts. 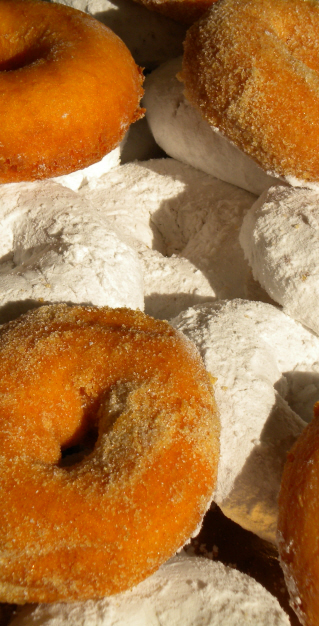 The powder donuts from celiac specialties bakery hit the spot and fill the craving we all have. Thank you so much for staying committed to providing great tasting gluten free products. Watch out, these are dangerously delicious!!! I would recommend buying two packs so you don't have to run back up to the store right away for more. Love, love, love these...they freeze well, also!! They are a "10"!! I purchased the powdered donuts at a local health food store. I almost didn't because of the price 6 for $10 at the store. But I have been so wishing for a powdered donut which were my favorite donuts prior to going gluten free - I have been gluten free for close to 2 decades now so the thought of this treat was overpowering! I had tried another brand of powdered donut before and they really weren't so good but I thought I'd go ahead and give in to temptation. So glad I did! Honestly, this donut was perfect! Worth every penny. I don't know what Celiac Specialties does but they nailed it. I am definitely going to try some of their other items as well. Celiac Specialties - thank you for doing what you do!! A great assortment of pastries! This is a basic donut with perfect taste. Actually better than store bought since they are so light and fluffly. Very good. As with most of the items at Celiac Specialties, and to do it without gluten and dairy. 2 thumbs up. These are great donuts! Taste just like the little Dolly Madison donuts I used to eat as a kid! !